Remember those frantic last days leading up to the Scottish referendum, when David Cameron et al descended on the cities and towns of that great nation like a gang of lovesick teenagers, desperate for a snog? Meanwhile, the rest of the unionists, casting around a positive message to woo the floating Scots, played a reverse version of the famous scene from The Life of Brian: what have the rest of us ever done for Scotland? Aside from bailing them out from something called the Darien Disaster, which was one of the reasons for the Act of Union in the first place, and some disputed mutterings about the generosity of the Barnett Formula, I didn’t hear much of consequence. But, if you switch things round and ask: what have the Scots ever done for us? Well, we could be here all day: television, telephone, penicillin, tarmac, economics, Irn Bru and the Krankies to name a few. To this list you can also add the noble game of golf; uisge beatha – water of life – in the form of Scotch whisky; and perhaps most nobly of all, the Scottish Highlands. However, while I love the wild beauty of the Highlands and penicillin in equal measure, I have never completely reconciled myself to golf and whisky. Golf is a game that requires supreme levels of skill, patience and a phlegmatic demeanour. None of which I possess. 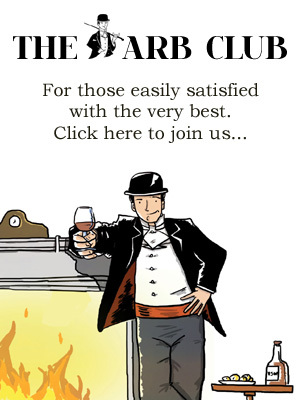 And whisky is a drink that seems to disagree with something deep inside me, causing immediate inebriation, followed by the kind of hangover Kingsley Amis wrote of in Lucky Jim (“his mouth has been used as a latrine by some small creature of the night, and then as its mausoleum”). I can’t even blame a lack of Celtic blood, being of Irish and Scottish stock, for these Sassenach tendencies. Nevertheless, I am always keen to revisit my prejudices to see if they still hold. 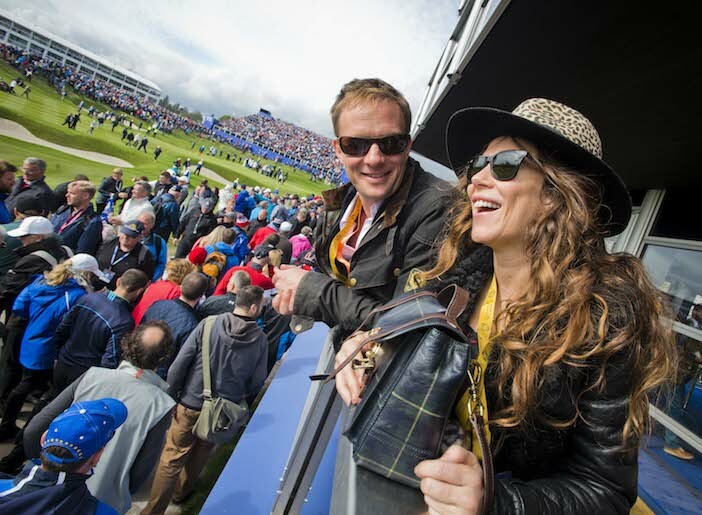 So the opportunity to combine Johnnie Walker Blue Label whisky, the 2014 Ryder Cup and a remote and fantastical lodge in the Highlands in one trip gave me the best possible chance to convert and see the error of my ways. Rather than taking the road to Damascus, my journey started with a flight from London to Glasgow, where we were met by a helicopter and whisked through the stormy Scottish skies, over lochs, burns and more than the odd Munro, to what must be one of the most remote places in the whole of Britain. The 57,000-acre Corrour Estate is served by its own train station, made famous as the location for Ewan Macgregor’s speech from Trainspotting (“it’s s***e being Scottish) and for being the highest in the UK. Mind you, if you arrive by train there’s a long drive round Loch Ossian to the estate’s modernist lodge – a Moshe Safdie designed replacement for the Victorian original. In fact, the best way to arrive is by air, as this also means you avoid the 11 mile drive from the nearest road! The ultimate owner of the estate is the billionaire Rausing family, of Tetra Pak fame. Unsurprisingly therefore, no expense was spared in the construction of the new lodge from imported Portuguese granite. 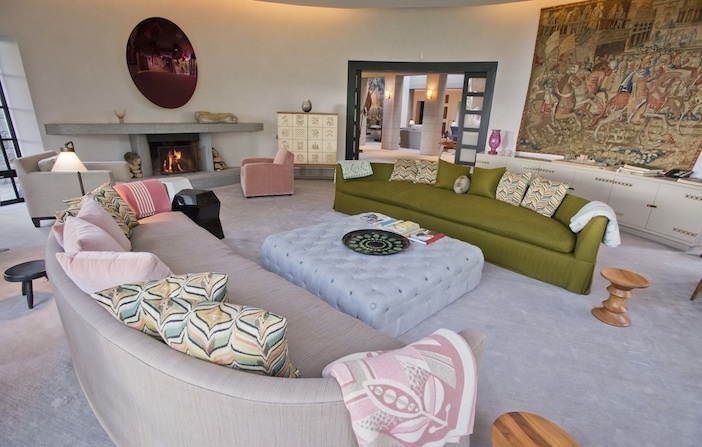 Nor in the interior design, which pairs sperm whale jaw bones with Irish Elk heads and 16th century Flemish tapestries with enough modern art to sustain a small gallery, including a scarlet sculpture by Anish Kapoor that hangs over the fireplace. 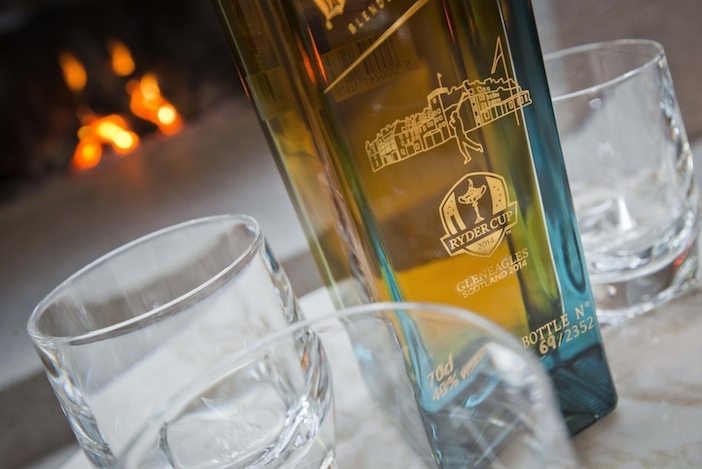 In honour of the golf, Johnnie Walker has issued a special Ryder Cup edition of their famous Blue Label whisky. The evening’s purpose was, therefore, a serious exploration of the signature Blue blend under the guidance of global brand ambassador, Tom Jones (not that one!). Apparently, only one in 10,000 barrels of whisky is judged good enough for inclusion in the final blend; and this smoothness was apparent as the first whisky of the evening slipped down surprisingly well. The fun continued with a dose of the Gentleman’s Wager, a Blue Label based cocktail developed by Erik Lorincz, and a whisky dinner, where I was stuffed with enough Corrour venison to keep my iron levels topped up ‘til Christmas. After dinner, as the drink flowed and I mingled with fellow lodgers, who included actors Anna Friel and Rupert Penry-Jones, my defences melted completely and I vowed to keep a place in my heart for Scotch from this day forth. At least that was until I woke up the next day with a hangover of Lucky Jimesque proportions. 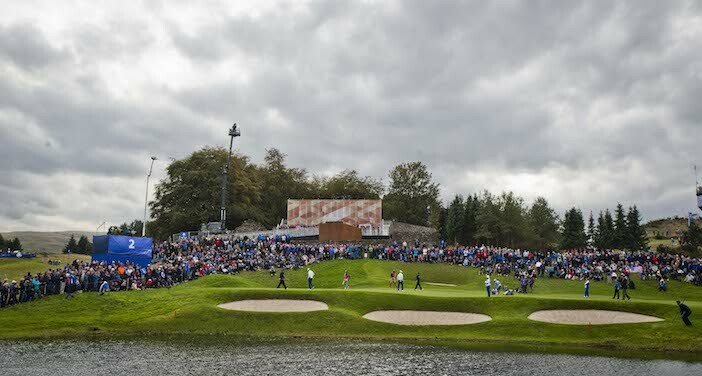 The morning helicopter ride to Gleneagles for day two of the 2014 Ryder Cup was therefore more of a trial than it should have been, but the excitement of being at the golf and spotting sporting legend Alan Hansen dispelled any remnants of the previous evening. With around 50,000 spectators all clamouring for a glimpse of a golf ball, getting close to the action wasn’t always easy. In fact, the closest I got was at the Johnnie Walker experience’s four hole, par 14 mini-golf course. In stark contrast to the activities outside the tent on the second green, an unsteady hand and erratic stroke meant it took me 15 shots to get round (taking inspiration from team USA, perhaps?). On the helicopter back to Glasgow Airport I reflected on my 24 hour Johnnie Walker Ryder Cup experience. Two lessons stood out: firstly, the one in 10,000 barrel smoothness of the Blue Label blend is a double-edged sword; and secondly, I need to start charging more for these articles if I want my own Moshe Safdie designed Highland lair. Sláinte! JOHNNIE WALKER™ Blue Label® ‘Ryder Cup Limited Edition’ Bottle is available now from the Whisky Shop, Alexander and James, Whisky Exchange and specialist whisky outlets at a recommended retail price of £225. Corrour Lodge is at the heart of the 57,000 acre Corrour Estate in the Scottish Highlands. To enquire about booking the Corrour Lodge please e-mail corrourlodge@corrour.co.uk. For information on the estate’s cottages and other accommodation at Corrour please visit their website.